Warning Signs! — Addisigns, Inc. When it comes to advertising, it is important to put your best foot forward. Inattentive businesses sometimes shoot themselves in the foot by publishing ads without thoroughly reviewing them for errors. This often leads to embarrassing and costly blunders. Looking for good deals? How does a “0% Off” sale grab you? No, that’s not a joke from a Woody Allen film. Believe it or not, that “deal” was actually featured on an enormous sign in front of a shop. One company’s promotional material proudly described, “upholding the highest standards for every ‘detal’.” While this business may have saved money by not hiring an editor, think about the number of potential customers who were turned away. While it’s common knowledge that good help is hard to come by, this fact is especially true when your business’s “accepting resumes” sign is posted directly above a trashcan. It makes you wonder how many resumes got dropped off in the trash! Upon delivery, one company discovered that their sign-maker had printed HTML text on a sign, rather than the image that the HTML text linked to. Talk about literal mindedness! Quality advertising has always been important for businesses, but today it is more critical than ever. With the rise of social media, consumers will often share interesting advertising campaigns with their friends and family. While this can be a great way of getting exposure for your business, beware, because this is a double-edged sword. Clever and funny advertisements are often shared so extensively that they end up going viral. On the other hand, advertisements with funny or embarrassing mistakes will also get widely circulated. You can be sure that any blunder printed on your business’s sign will be featured on Facebook, Twitter and Reddit within a few hours. This puts the lie to the expression: “all publicity is good publicity”. Let Addisigns give you the peace of mind that comes from working with a company that has over 50 years of experience in the sign making business. 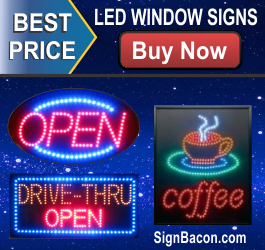 Rest assured knowing that your sign will leave a lasting and positive impression on your prospective customers.